"Ava, what are you doing?" "I'm typing Grandma an email!" "Oh really? What are you typing?" "I'm typing Grandma an email on Google+!" This morning..."Mom, can you make me a steamer?" Every night I rub Ava's feet....tonight she said, "I have toe fungus! Don't ruv (rub) my toe fungus!!" Troy and Lyle left on Tuesday...Lyle had been here for a week and Troy for 4 days. Good times. Donald left for Texas on Wednesday at 3 am...the house seemed really empty when I woke up that morning after having the workers and then everyone leaving! He'll be gone until next Thursday...It's gonna be a long week. Good thing I have lots of cleaning and sewing to do! Ava and I went to story time at the library today for the first time ever. It took her awhile to get warmed up but I think she liked it. They danced and read books...at the end there were bubbles and hand stamps! Ava has been doing great with the whole potty thing (except for the poop part). I ordered a new toilet seat on Amazon and I love it! It has a kid seat built right in so you don't have to keep taking the trainer off when adults use it - and it's much more clean. She did have a little accident today...2nd one since we started. Bummer. Oh well..it might have been a good reminder for her of what happens if she goes in her underwear! She went to bed late tonight...we had supper at 9:30!!! Oops! We were in the kitchen waiting for the noodles to finish and she grabbed my hands and told me that I was her "Best friend ever! Best girl ever!" Oh, I love her. The washing machine died and was resurrected yesterday...the pump had been making awful noises for a week or so and finally just stopped spinning and pumping. Donald took apart the pump and found a bobby pin!!! Haha!! Now it works just fine! Yay for not having to spend $400 on a new washing machine! We're having a girl!! Ava will have a little baby sister! She's going to name her "Black." :) I think she looks just like Ava...same Waldo nose! 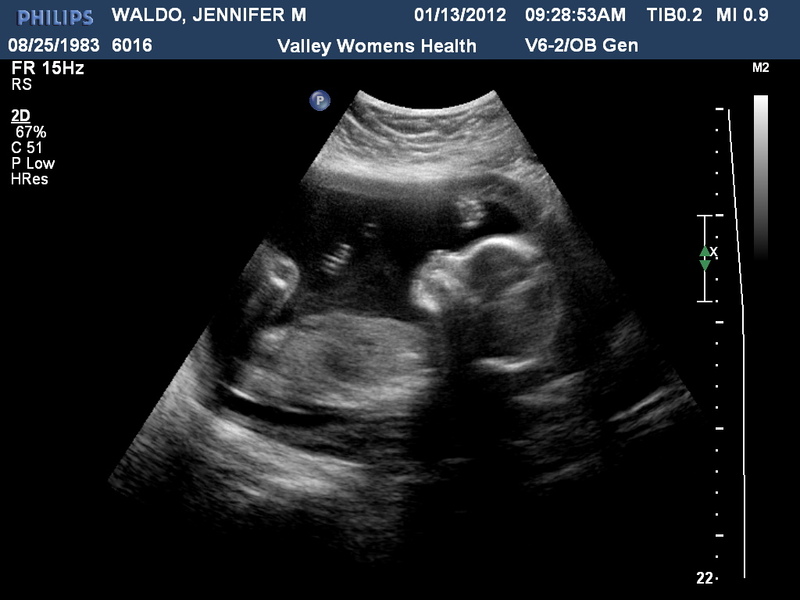 Everything looked perfect on the ultrasound...except for one little bright spot on her heart. The midwife says that it's nothing and I believe her...but she had to tell me. Ugh. Over half done and I've gained five pounds. Yay. Donald has been practicing his new clarinet and violin...Ava got a recorder at a birthday party the other day and calls it her "clari-ner-net." She sleeps with it. We went to the dentist on Thursday and Ava had her nap cut short because we had to leave for the appt. She screamed, cried and threw fits all the way there...for an hour! We were pulling into the parking lot and Donald sarcastically said, "Wow, she sure is happy." Ava screams from the back seat, "I'M NOT HAPPY!!" Ha. Seriously. Potty training is going great...she still wears a pull-up to town and a diaper to bed because she hasn't mastered the #2 part yet and I really don't want to deal with that mess. But, only one potty accident in almost 2 weeks and that was on the second day. She even asks to go potty when we're not at home and she's wearing a pull-up...when we get home, the pull-up is dry. So proud of her. For some reason, Ava has still been extra bratty, emotional and whiney. I hope it's just something that she needs to work out...we've started time-outs and it seems to work to get her back on track. For example...she has rice krispies for breakfast and I won't let her put her own sugar on her cereal...she has a meltdown, won't eat and won't stop crying. It's horrible. So, she gets a spanking, sits in the timeout chair and I set the timer for 3 minutes. Usually, she's ready to say "sorry" and eat her cereal by the time the beeper goes off. Trial and error. Ava has started taking an interest in dressing herself and picking out her own clothes. Oh, and one more thing...she gets out of her bed and comes down all by herself in the morning!!! Finally!!! Yesterday was the first day of no diapers except for nap time and night time. I feel that it was a complete success....Accidents - 0 / Toilet - 5. The first thing she asked this morning was to go potty! Yay! So we're on to day two of potty training. Last night when I put her to bed, she was laying there and I was rubbing her feet with lotion...she looked up at me and chuckled her little fake chuckle and said, "You yook yike Grandma!" Not sure if I heard her right, I asked, "I look like Grandma?" The big news for today is that Ava went potty in the toilet for THE FIRST TIME EVER!!!! I know that it's only the beginning but hey, I'm excited!! I gave her a bath this morning and put undies on her afterward....we ran to the bathroom over and over for 3 hours with no luck. Then..it was nap time and I told her we were going to try one more time....so she did...nothing at first and then all of a sudden, I heard it!!! I think she was as surprised as I was!! I was so excited! She was so excited! I gave her jelly beans and we had to call Grandma Lund right away to tell her the news!!! I can't believe it's already 2012. Time flies...I'm excited to see what the year will bring. We had a wonderful weekend with Uncle Lyle and Steve Marshall (VA). Steve is Donald and Lyle's second cousin. It was so nice to have them here....Donald took Ava and Steve to the air museum on Saturday. I was reminded of something that Ava said awhile back...I think it was Donald, he told Ava that she was cute and she replied, "I'm not cute, I'm perfect!" Ha. P.S. I think our washing machine just broke. Great.